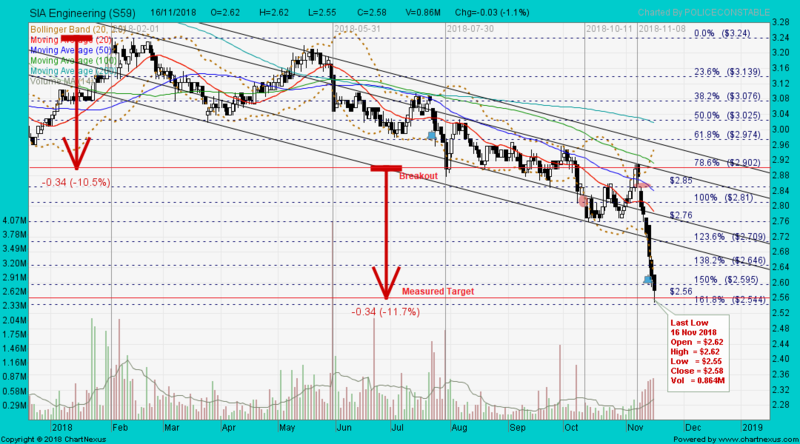 Low of OCBC maintained “Buy” on SingPost, TP $1.23. CGS-CIMB’s Goh has a target price of $1.12 on SingPost, implying 20.3 times FY20F earnings. Year to date, shares in SingPost are down 18.3% to close at $1.04 on Friday 2 Nov 2018. SingPost closed with a hammer @ S$0.995 (-0.005, -0.5%) with 6.13m shares done on 9 Nov 2018. 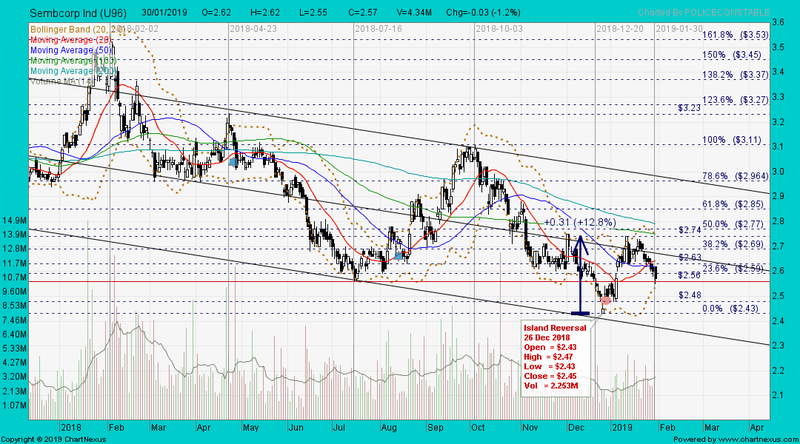 Immediate support @ S$0.965, immediate resistance @ S$1.02. SingPost closed with a black marubozu @ S$1.25 (-0.13, -9.4%) with 22.7m shares done on 3 Aug 2018. 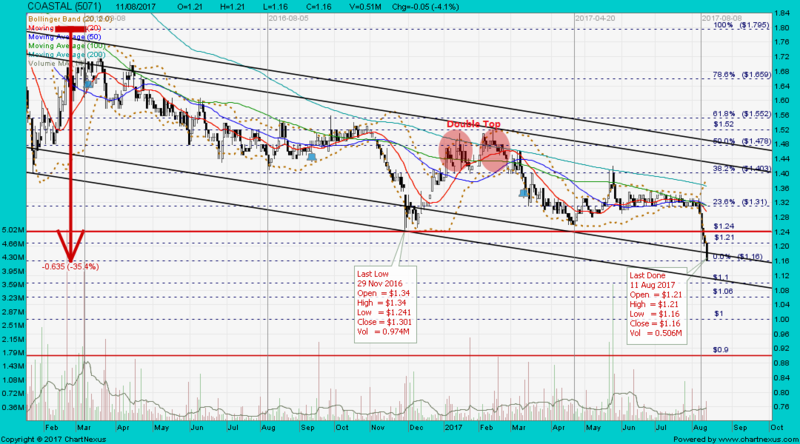 Immediate support @ S$1.23, immediate resistance @ S$1.28. 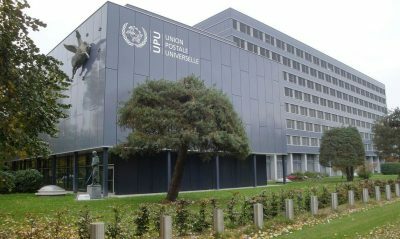 Rather than negotiate revised postal rates, through the auspices of the UPU, which was established to standardize the world’s postal system, Trump plans to leave the organization. SingPost closed @ S$1.25 as at 3 Aug 2018. SingPost closed @ S$0.995 as at 9 Nov 2018. Axiata gapped down and closed with a black marubozu @ RM3.45 (-0.07, -2%) with 3.99m shares done on 13 Nov 2018. 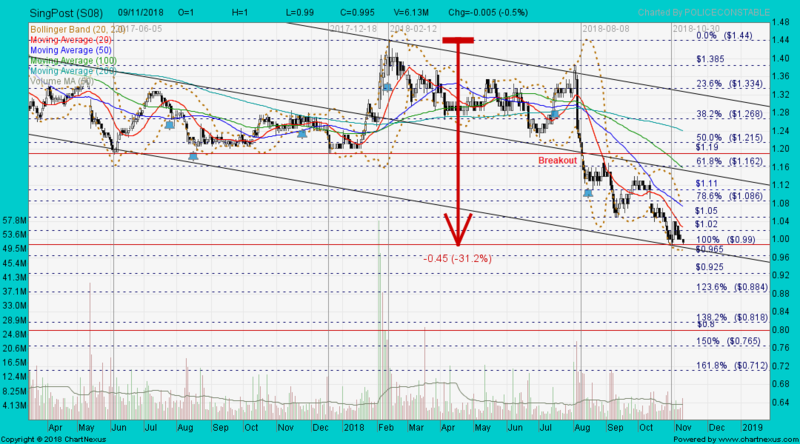 Immediate support @ RM3.37, immediate resistance @ RM3.50. 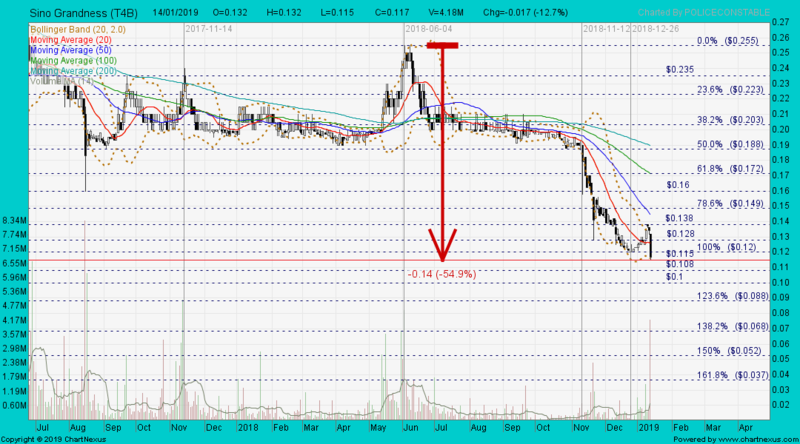 M1 peaked @ S$3.78 on 2 Mar 2015 and hit a last low of S$1.46 on 22 Jun 2018. M1 closed with a spinning top @ S$3.11 (-0.02, -0.6%) with 960,000 shares done on 3 Aug 2015. 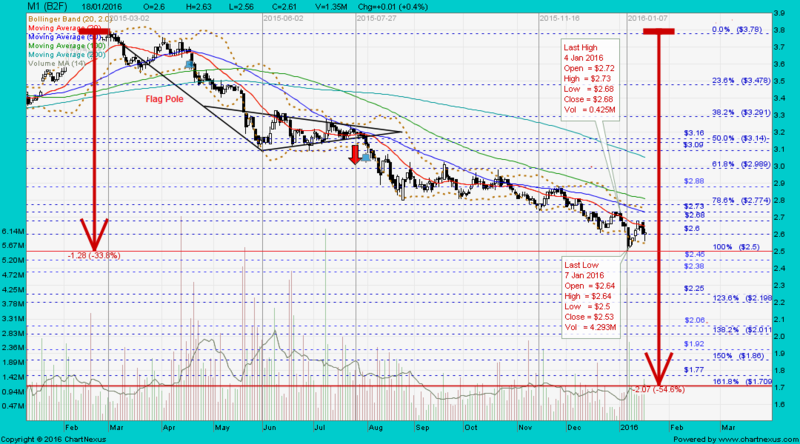 Immediate support @ S$3.09, immediate resistance @ S$3.16. M1 closed with a hammer @ S$2.61 (+0.01, +0.4%) with 1.35m shares done on 18 Jan 2016. 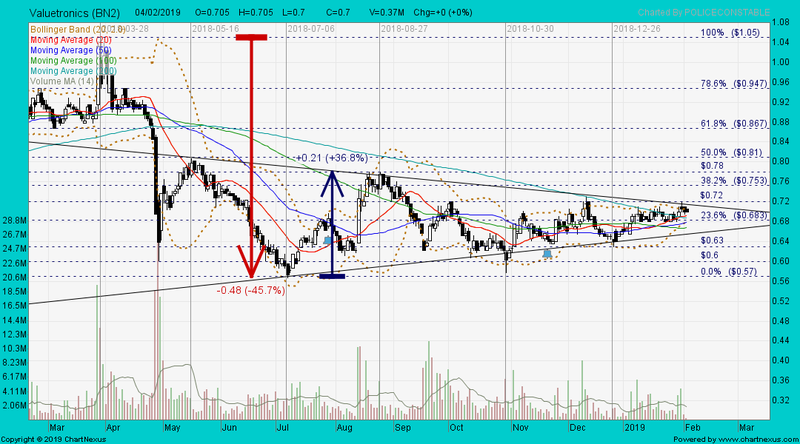 Immediate support @ S$2.50, immediate resistance @ S$2.68. M1 closed with a white marubozu unchanged @ S$2.11 with 540,000 shares done on 13 Nov 2018. 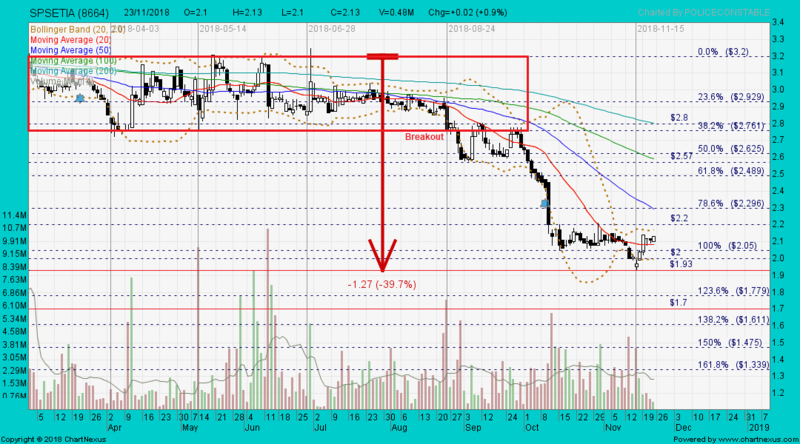 Immediate support @ S$2.08, immediate resistance @ S$2.13. 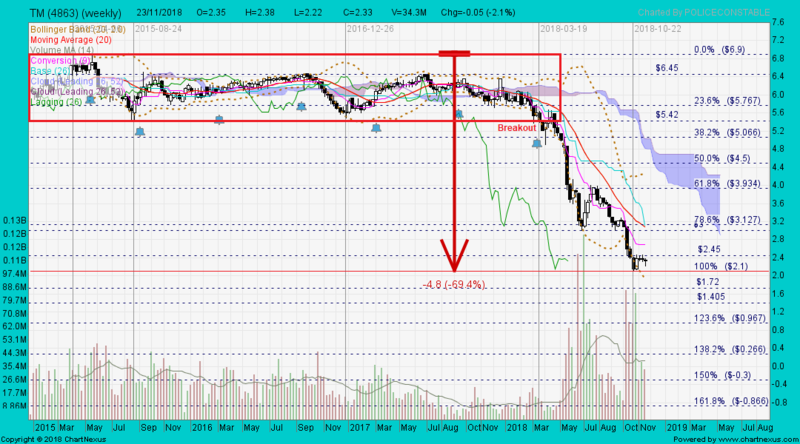 Using charts to see the correlation between oil prices and Singapore rigbuilders; Keppel Corp, Sembcorp Industries and Sembcorp Marine. 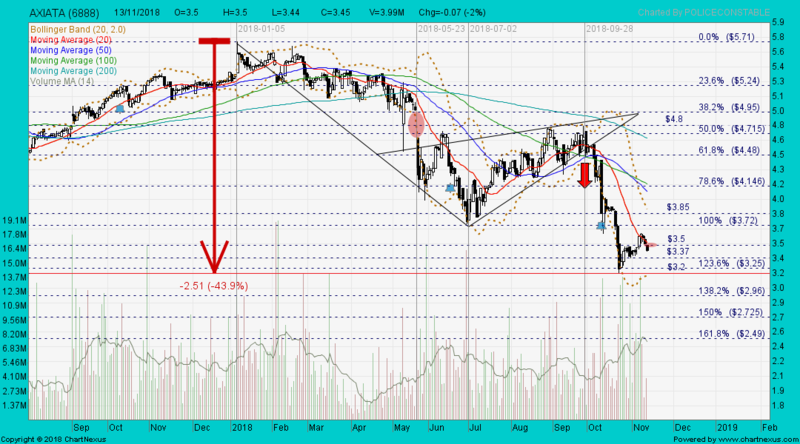 • A fall in oil price is negative for rigbuilders Keppel Corp, Sembcorp Industries and Sembcorp Marine. US oil prices plummeted 7% to a one-year low of $55.69 a barrel on Tuesday. It was crude's worst day since September 2015. 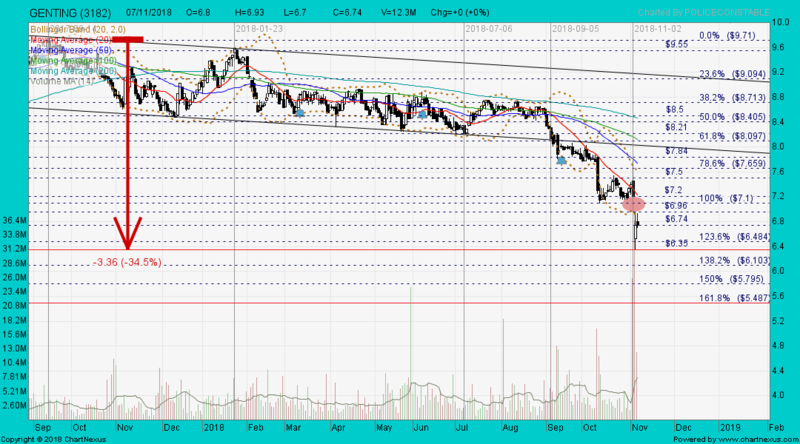 KepCorp @ S$6.28 on 13 Nov 2018. SembCorp Industries @ S$2.68 on 13 Nov 2018. SembCorp Marine @ S$1.66 on 13 Nov 2018. US Brent crude futures @ US$65.86 per barrel on 14 Nov 2018 at 0951 hrs. US WTI futures @ US$55.80 per barrel on 14 Nov 2018 at 0951 hrs. 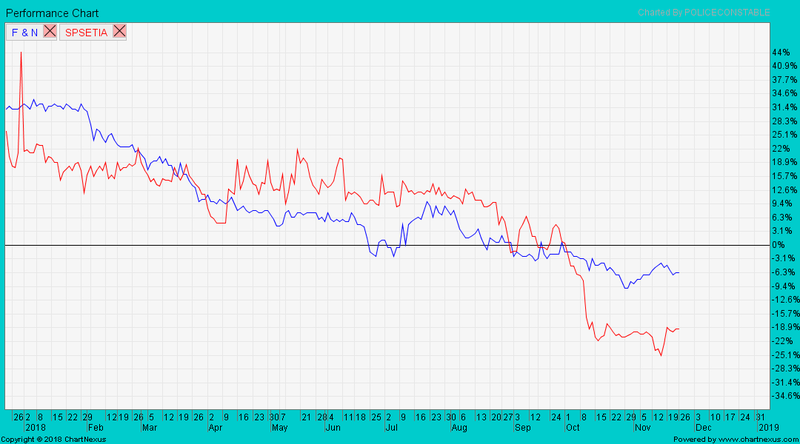 Using charts to see the correlation between oil prices and Singapore Airlines. • A fall in oil price although negative for Singapore Airlines but it has less impact due to oil hedging using futures contracts. Singapore Airlines @ S$9.42 on 13 Nov 2018. Year to date, shares of Olam are down 13.2% to close at $1.77 on Tuesday before the results announcement. OLAM closed with a black marubozu @ S$1.68 (-0.09, -5.1%) with 1.11m shares done on 14 Nov 2018. 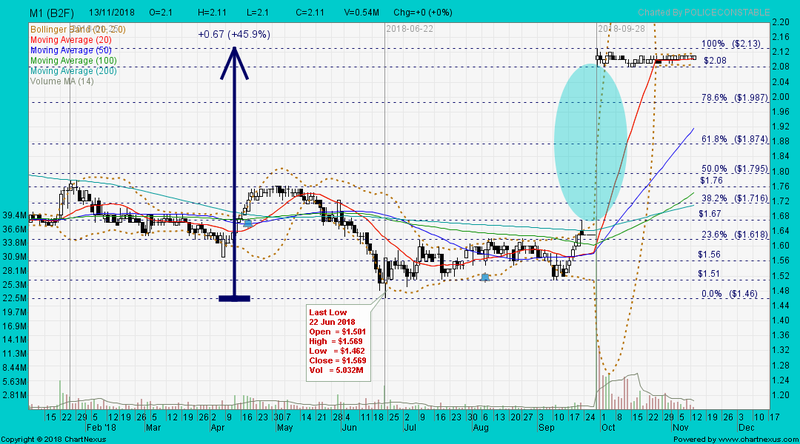 Immediate support @ S$1.67, Immediate resistance @ S$1.75. OLAM closed with a hammer @ S$1.82 (-0.10, -5.2%) with strong volume done at 4.35m shares on 10 Oct 2018. 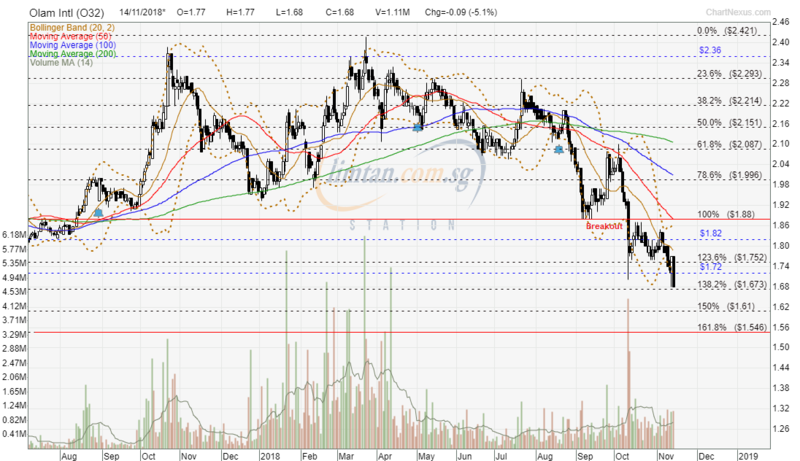 Immediate support @ S$1.70, Immediate resistance @ S$1.88. ARMADA closed with an inverted hammer @ RM0.335 (-0.01, -2.9%) with 11.0m shares done on 14 Nov 2018. 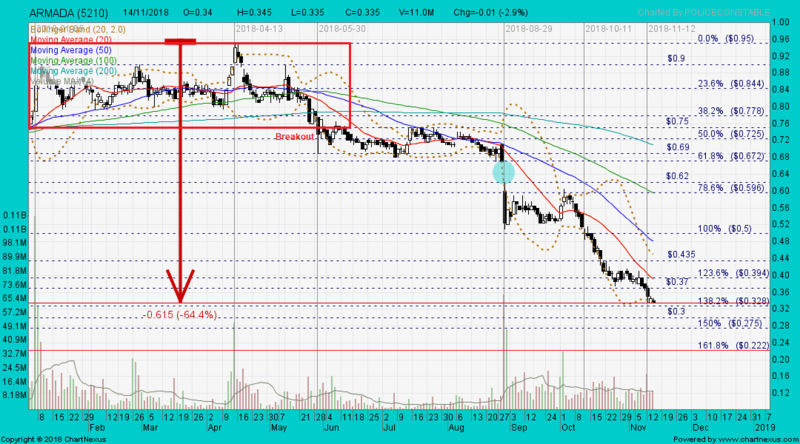 Immediate support @ RM0.32, immediate resistance @ RM0.37. APTT gapped down with a hammer and closed @ S$0.16 (-0.155, -49.2%) with 2.73m shares done on 14 Nov 2018. 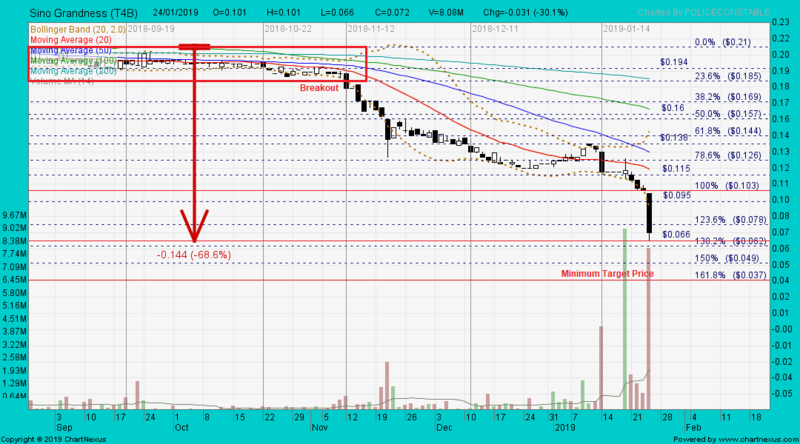 Immediate support @ S$0.15, immediate resistance @ S$0.19. Note: Typo error amended in red colour. APTT gapped down with a hammer and closed @ S$0.16 (-0.155, -49.2%) with strong volume done at 0.11 billion or 110 million shares on 14 Nov 2018. Sino Haijing ~ Typical example of a Bearish Rectangle Breakout. CDL closed with a spinning top @ @ S$8.30 (+0.07, +0.9%) with 1.37m shares done on 15 Nov 2018. 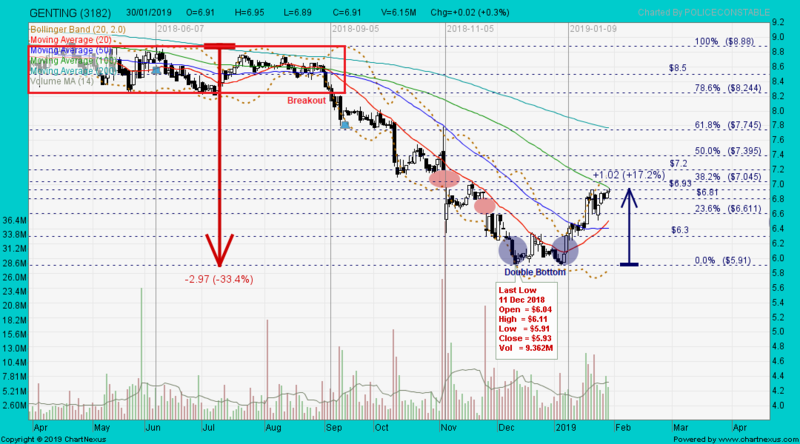 Immediate support @ S$7.80, immediate resistance @ S$8.55. 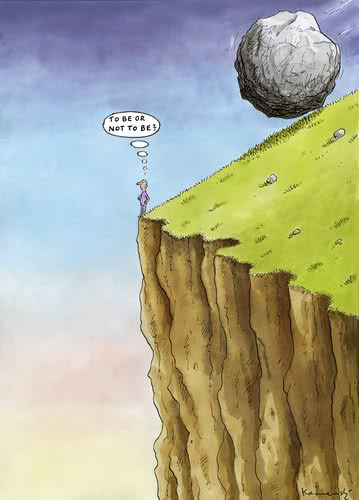 The Matthew Effect: What seems high will go higher, what seems low will go lower. Ascending triangle is a bullish chart pattern that indicates accumulation. Descending triangle is a bearish chart pattern that indicates distribution. SIA Engg closed with a hammer @ S$2.58 (-0.03, -1.9%) with 860,000 shares done on 16 Nov 2018. 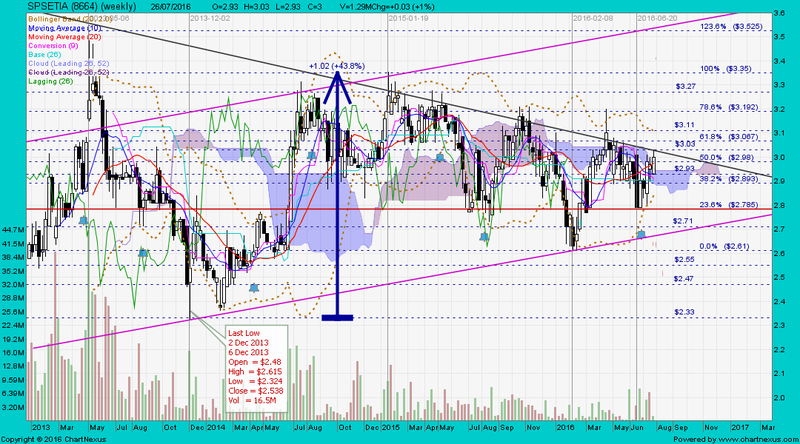 Immediate support @ S$2.50, immediate resistance @ S$2.62. SIA Engg closed with a hammer @ S$3.19 (-0.03, -0.9%) with high volume done at 6.01m shares on 6 Oct 2017. 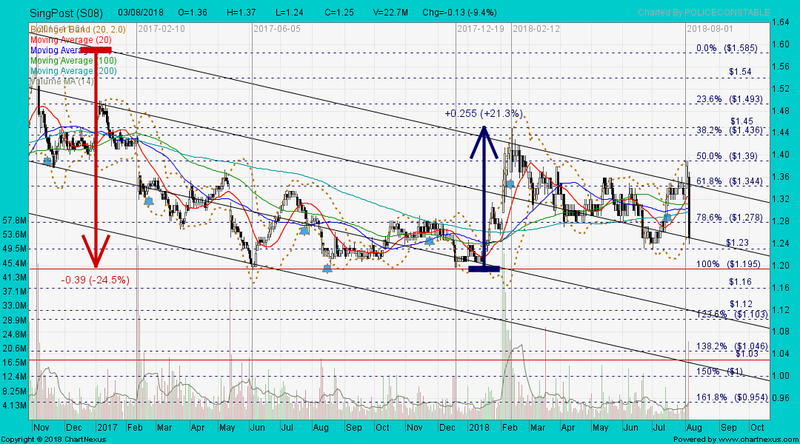 Immediate support @ S$3.15, immediate resistance @ S$3.25. In technical analysis, when a stock is in a bear-market territory, the last low will be retested and the share price will move much further down, forming a new record low. odie sold IndoAgri @ S$0.44 and lost 2 cts on 2 Oct 2017. What is the moral of the story? 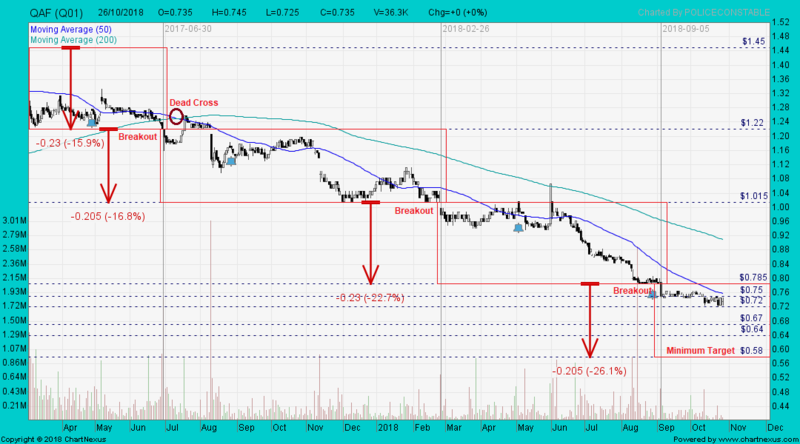 It is important to know how to set stop-loss (SL) and take-profit or target profit (TP) levels. These 2 are the most significant elements of trade management. A stop-loss is to limit the losses on an open position. A take-profit is to close a position when a certain price reaches a specified price level in profit (in-the-money). IndoAgri closed with a white marubozu unchanged @ S$0.20 with 170,000 shares done on 16 Nov 2018. 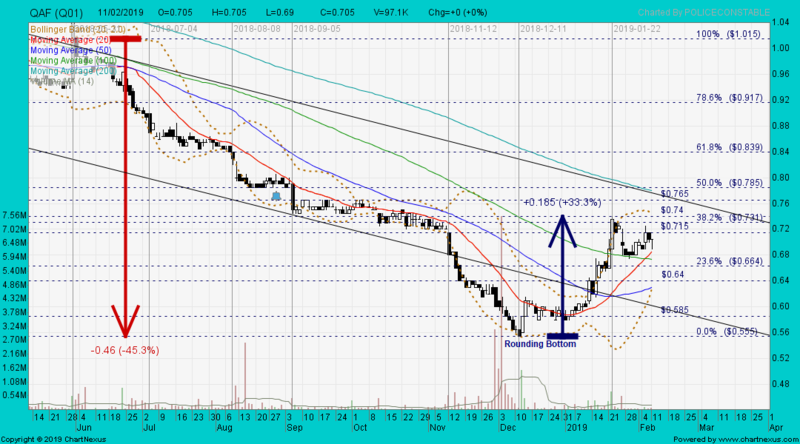 Immediate support @ S$0.195, immediate resistance @ S$0.215. IndoAgri reported earnings of Rp8.8 billion ($0.8 million) for the 3Q ended Sept, representing a 91.3% plunge from its 3Q17 earnings of Rp100.5 billion a year ago. 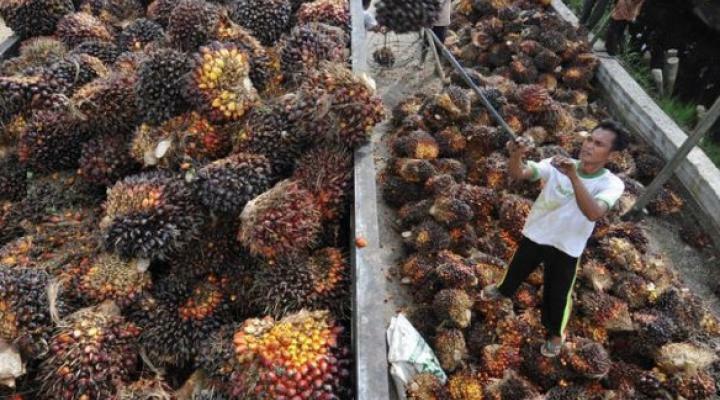 Indo Agri posted a second-quarter net loss of 68.6 billion rupiah (S$6.4 million), versus a net profit of 99.28 billion rupiah a year ago, weighed down by a decline in revenue and foreign exchange losses. IndoAgri reported earnings of Rp 49.8 billion ($4.8 million) for the 1Q18 ended Mar, down more than threefold from Rp 170.6 billion a year ago on lower sales volume and selling prices of palm products. First Reit closed with a black marubozu @ S$1.04 (-0.08, -7.1%) with 4.66m shares done on 19 Nov 2018. 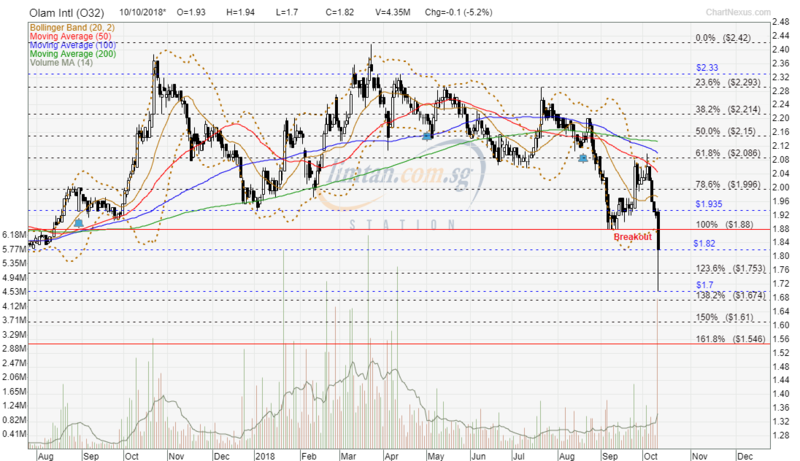 Immediate support @ S$1.02, immediate resistance @ S$1.13. Keppel KBS US Reit closed with a gravestone doji unchanged @ US$0.58 with 1.09m shares done on 19 Nov 2018. 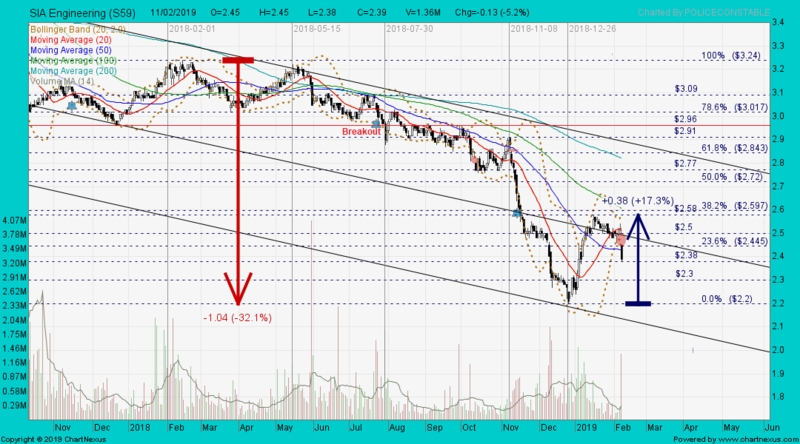 Immediate support @ US$0.57, immediate resistance @ US$0.60. First Reit had a black marubozu and traded @ S$0.945 (-0.095, -9.1%) with 4.11m shares done on 20 Nov 2018 at 1200 hrs. 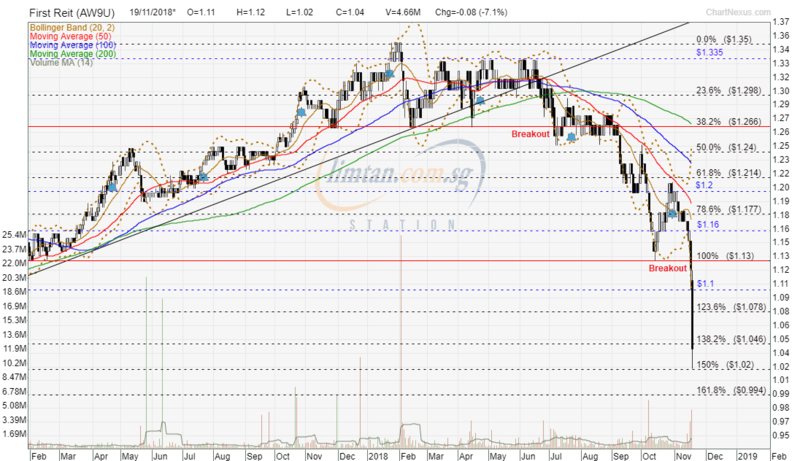 Immediate support @ S$0.94, immediate resistance @ S$1.04. The most powerful volatility breakout indicator is the Bollinger Bands. Relatively narrow band width can predict a big advance or decline. 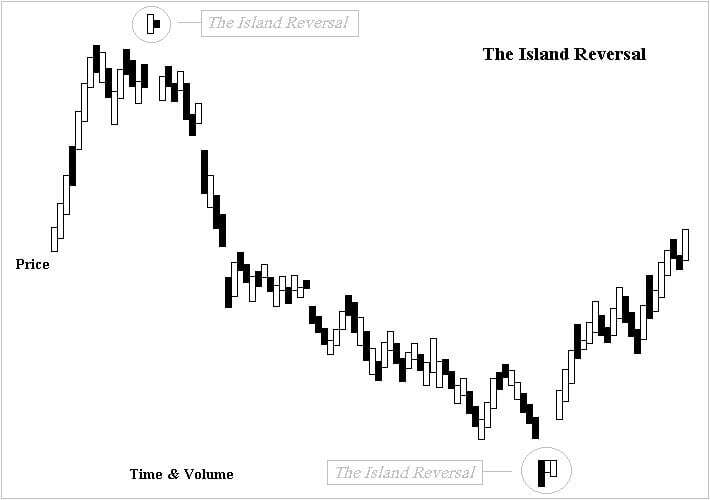 When volatility expands and a stock or index breaks out of a trading range, it signals a change to a period of higher volatility and a possible directional move. 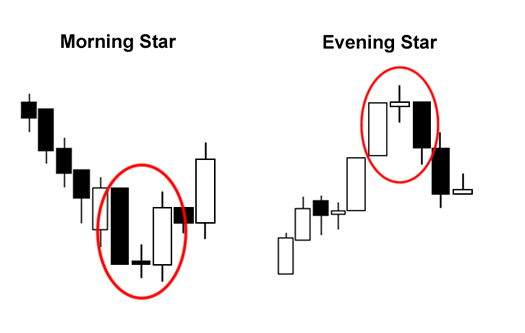 Sometimes, certain signals could only be visible on the chart when the share price starts its unusual / volatile movement (up or down all in a row, with or without volume). Bollinger bands are very powerful technical indicator. When using it as a key indicator, volume is not necessarily required, instead, the breakout (upside or downside) at the upper or lower Bollinger band is more important. 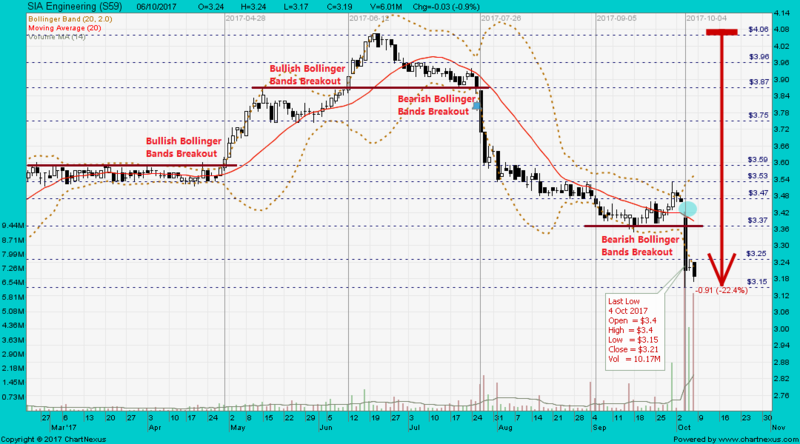 Likewise, in a downtrend, volume is not required for a downside breakout at support level. 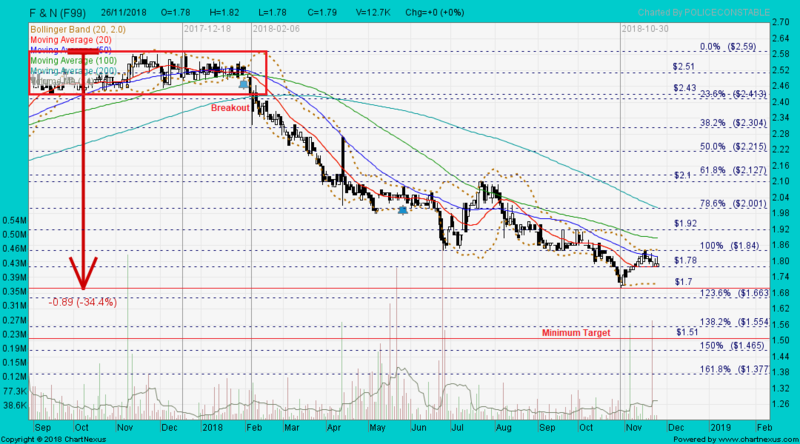 However, in an uptrend, volume is necessary for an upside breakout at resistance level. A price drop (or rise) on high volume all in a row is a stronger signal indicating that something in the stock has fundamentally changed. 3. 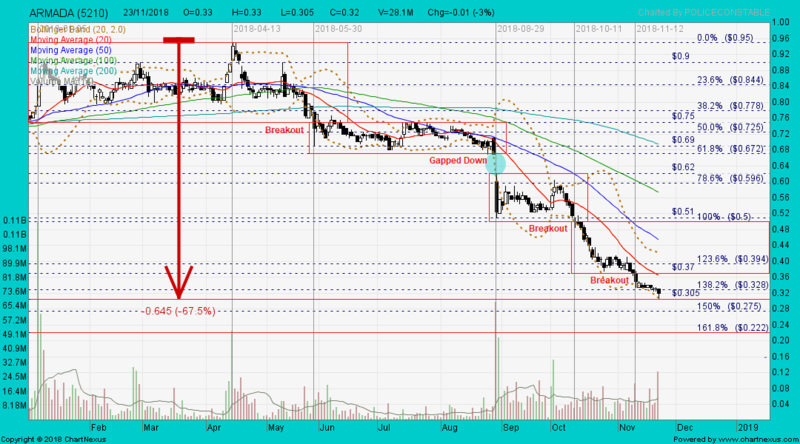 Do not catch a stock falling on high volume or one that is rising on thin volume. First Reit closed with a spinning top @ S$1.03 (-0.01, -1%) with 650,000 shares done on 23 Nov 2018. 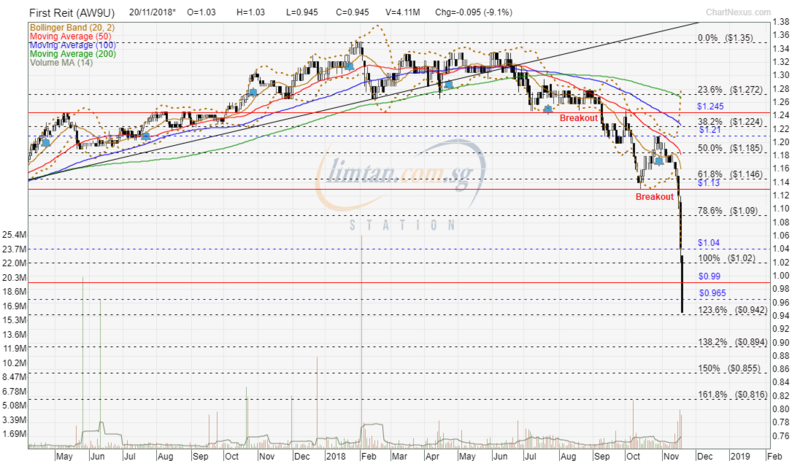 Immediate support @ S$0.97, immediate resistance @ S$1.05. ARMADA closed with a hammer @ RM0.32 (-0.01, -3%) with 28.1m shares done on 23 Nov 2018. 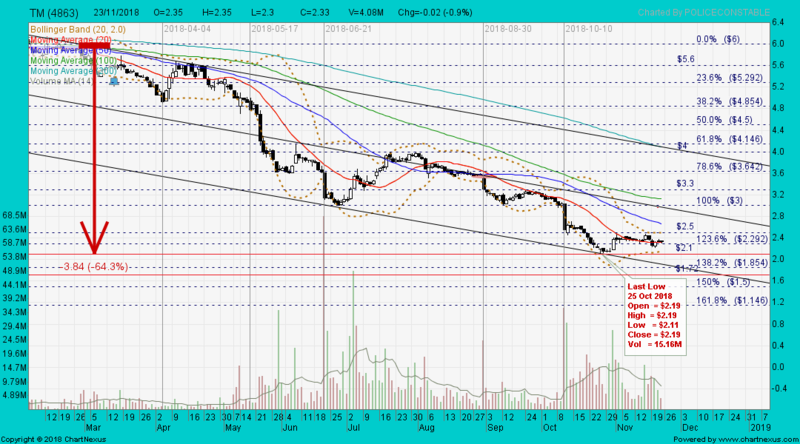 Immediate support @ RM0.275, immediate resistance @ RM0.325. Investors who followed the analyst's recommendation would have received a negative 11% return in the past year, compared with the negative 36% return on the shares. SP Setia closed with a white marubozu @ RM2.13 (+0.02, +0.9%) with 480,000 shares on 23 Nov 2018. 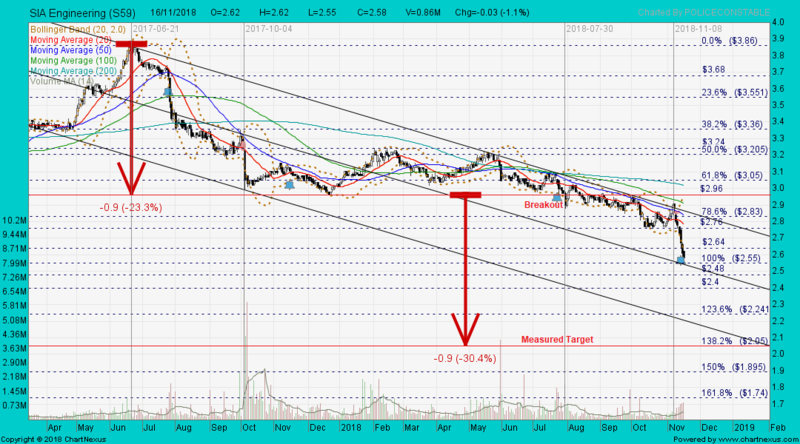 Immediate support @ RM2.05, immediate resistance @ RM2.20. SIME closed with a hanging man @ RM2.47 (+0.01, +0.4%) with 2.40m shares done on 23 Nov 2018. 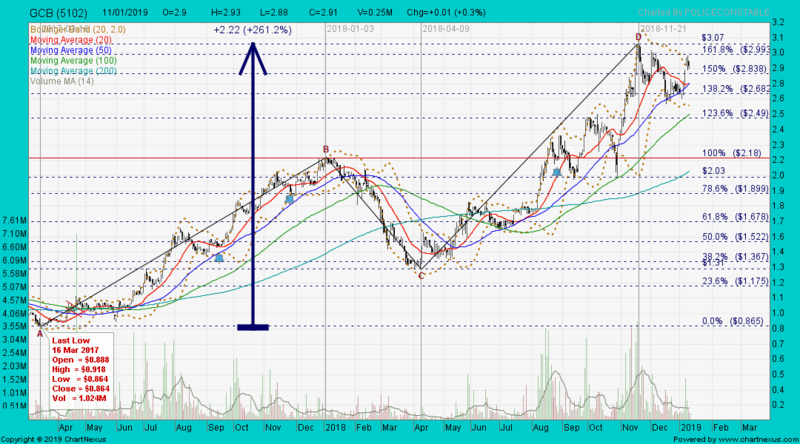 Immediate support @ RM2.35, immediate resistance @ RM2.52. SIME closed with a white marubozu @ RM2.20 (+0.04, +1.9%) with 10.7m shares done on 30 Oct 2018. Immediate support @ RM2.10, immediate resistance @ RM2.29. SIME closed with a white marubozu @ RM2.64 (+0.03, +1.1%) with 7.06m shares done on 2 Oct 2018. Immediate support @ RM2.59, immediate resistance @ RM2.69. TM closed with a hammer @ RM2.33 (-0.02, -0.9%) with 4.08m shares done on 23 Nov 2018. Immediate support @ RM2.10, immediate resistance @ RM2.50. 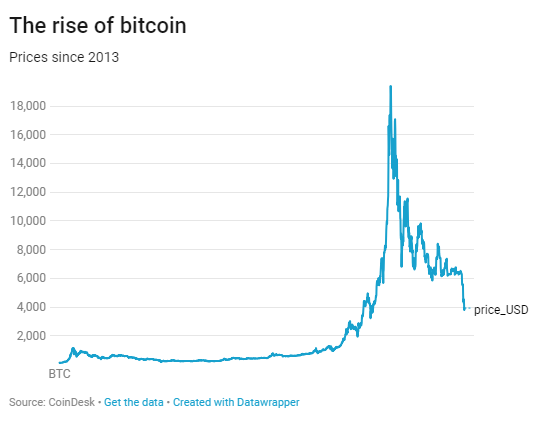 Bitcoin slid below $3,500 for the first time in 14 months, then later recovered toward the $3,900 level by Monday. That brings its decline from last year's peak to more than 81%. 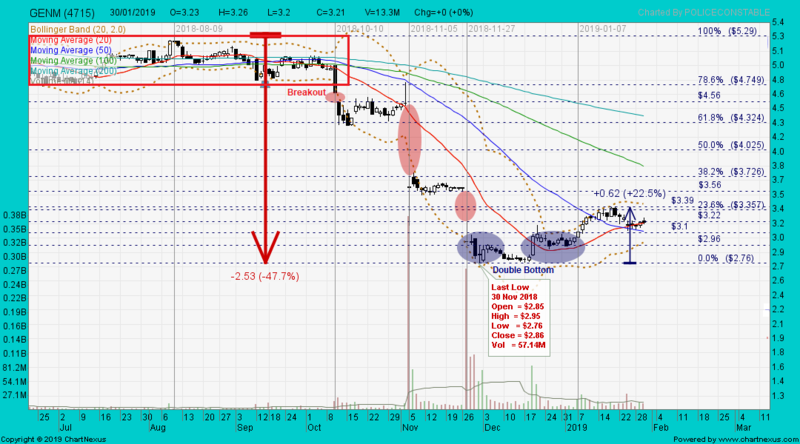 F&N closed with an inverted hammer @ S$1.79 with thin volume done at 12,700 shares on 26 Nov 2018. 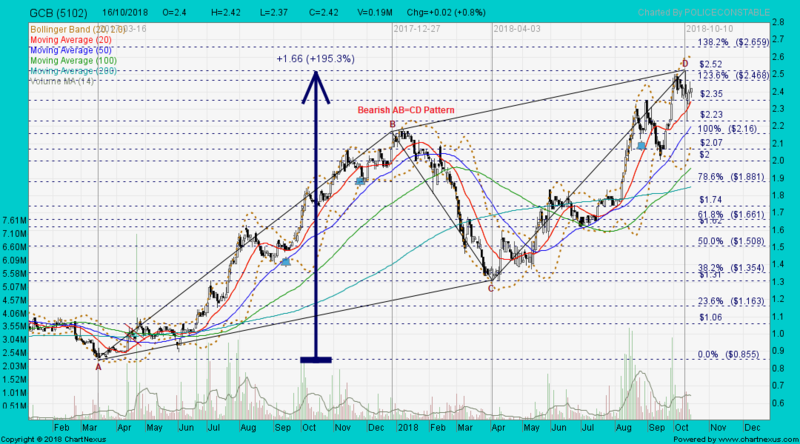 Immediate support @ S$1.70, immediate resistance @ S$1.84. On Monday, Kuala Lumpur-based Genting Malaysia Berhad filed a breach-of -contract lawsuit in federal court in Los Angeles saying that Fox was pressured to terminate the agreement by its soon-to-be owner Disney. The company alleges that Disney wants to avoid doing business with organizations involved in the casino business. “Disney wanted no association with a gaming company like [Genting Malaysia] due to Disney’s ‘family-friendly’ brand strategy,” the lawsuit says. 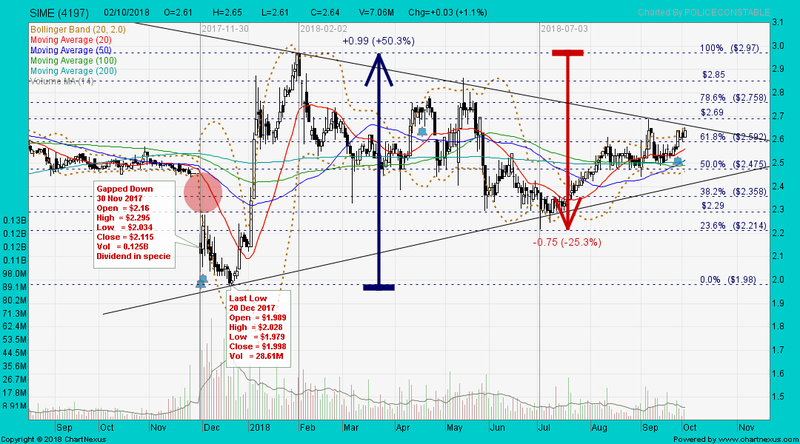 GENM gapped down with a doji and closed @ RM3.00 (-0.60, -16.7%) with high volume done at 280m shares on 27 Nov 2018. 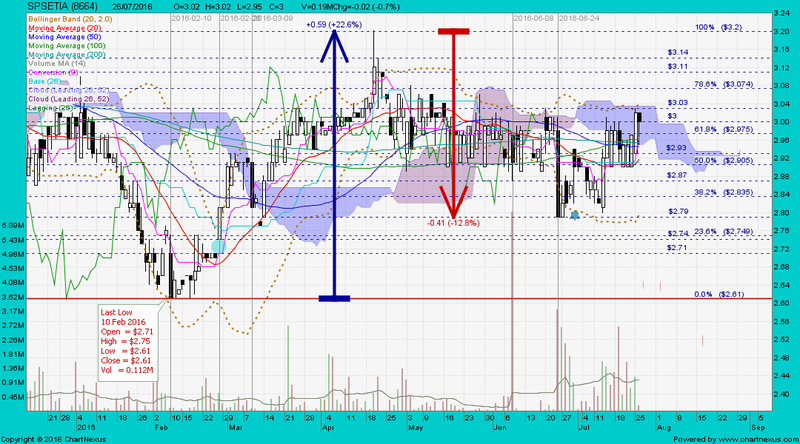 Immediate support @ RM2.93, immediate resistance @ RM3.18. GENM closed with a hammer @ RM3.60 (-0.04, -1.1%) with 31.6m shares done on 8 Nov 2018. 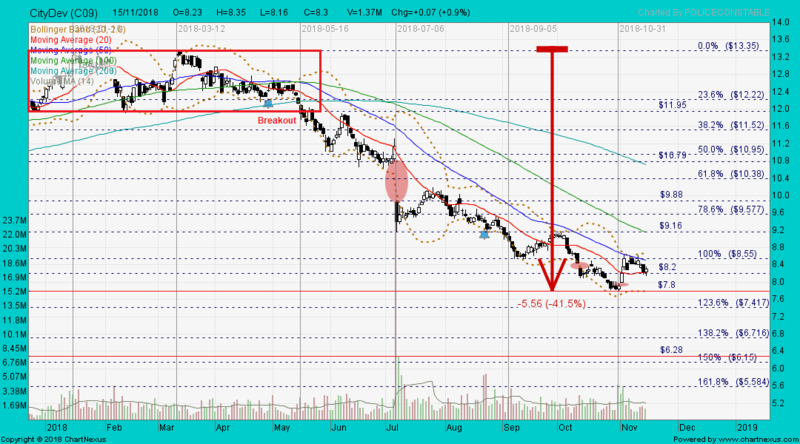 Immediate support @ RM3.50, immediate resistance @ RM3.72. GENTING closed with a spinning top @ RM6.38 (-0.52, -7.5%) with 21.0m shares done on 27 Nov 2018. 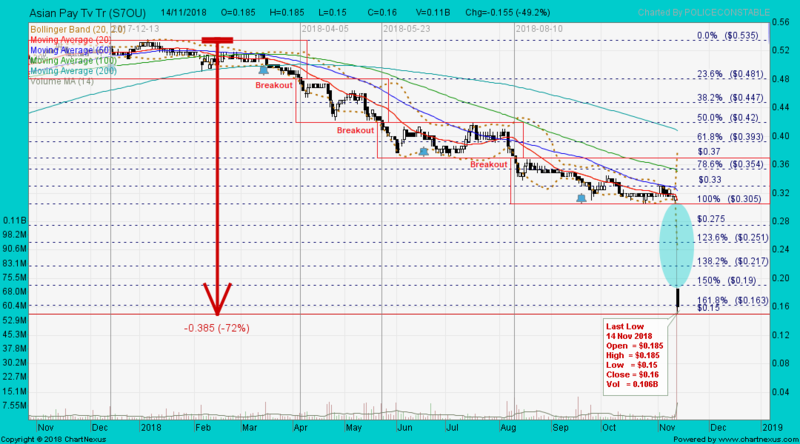 Immediate support @ RM6.10, immediate resistance @ RM6.96. GENTING closed with a spinning top unchanged @ RM6.74 with 12.3m shares done on 7 Nov 2018. 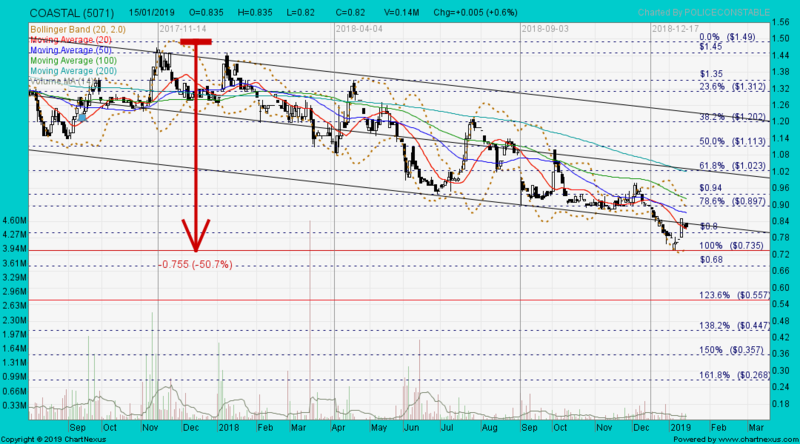 Immediate support @ RM6.48, immediate resistance @ RM6.96. Only World Group (OWG) is also impacted by the fallout from the Genting Malaysia Bhd’s US$1bil deal with Walt Disney Co and 21st Century Fox Inc.
OWG closed with a black marubozu @ RM0.485 (-0.135, -21.8%) with 13.4m shares done on 27 Nov 2018. 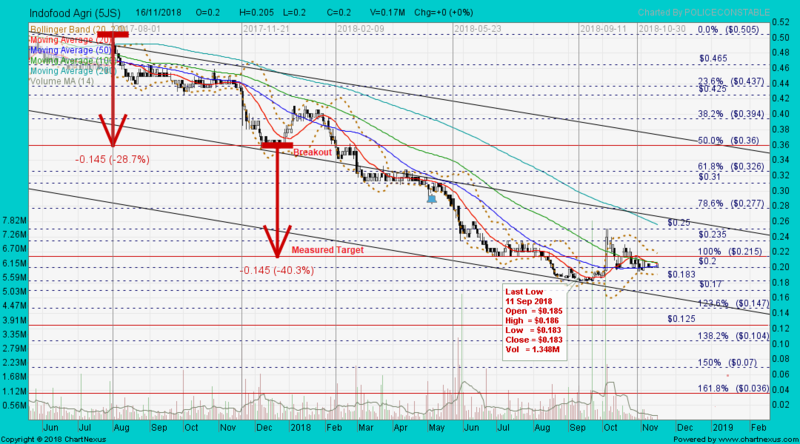 Immediate support @ RM0.44, immediate resistance @ RM0.595. Guan Chong closed with a spinning top @ RM2.91 (+0.01, +0.3%) with 250,000 shares done on 11 Jan 2019. 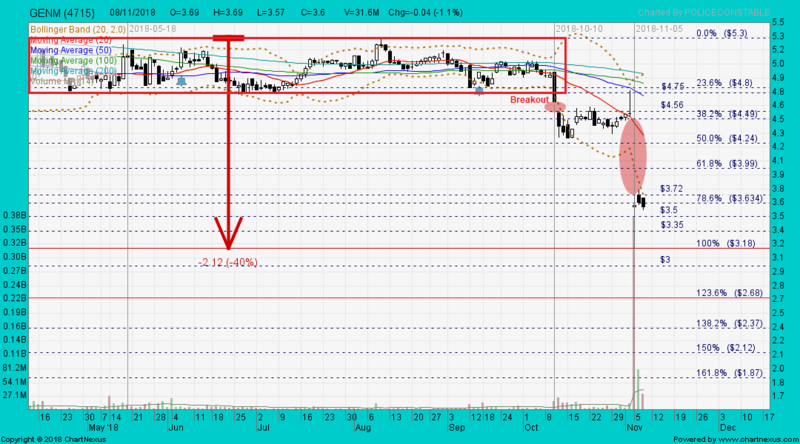 Immediate Support @ RM2.83, immediate resistance @ RM2.99. Guan Chong closed with a hanging man @ RM2.42 (+0.02, +0.8%) with 190,000 shares done on 16 Oct 2018. COASTAL closed with a black marubozu @ RM0.82 (+0.005, +0.6%) with 140,000 shares done on 15 Jan 2019. Sino Grandness closed with a black marubozu @ S$0.117 (-0.017, -12.7%) with 4.18m shares done on 14 Jan 2019. 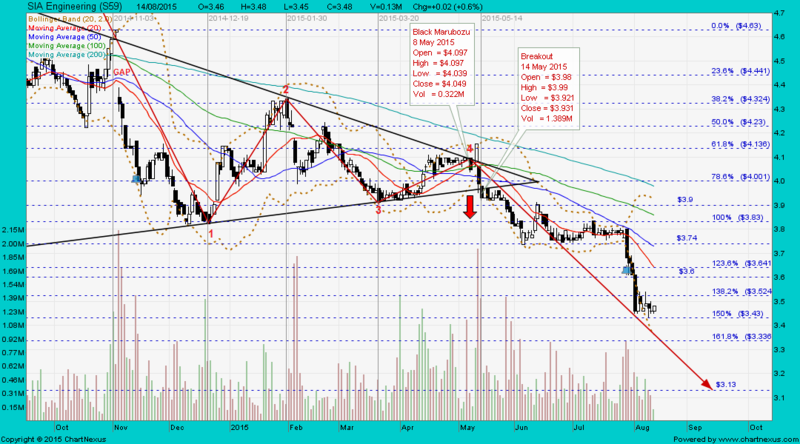 Immediate support @ S$0.108, immediate resistance @ S$0.128. It is only with the heart that one can see rightly what is essential is invisible to the eye. Sino Grandness closed with a black marubozu @ S$0.072 (-0.031, -30.1%) with 8.08m shares done on 24 Jan 2019. 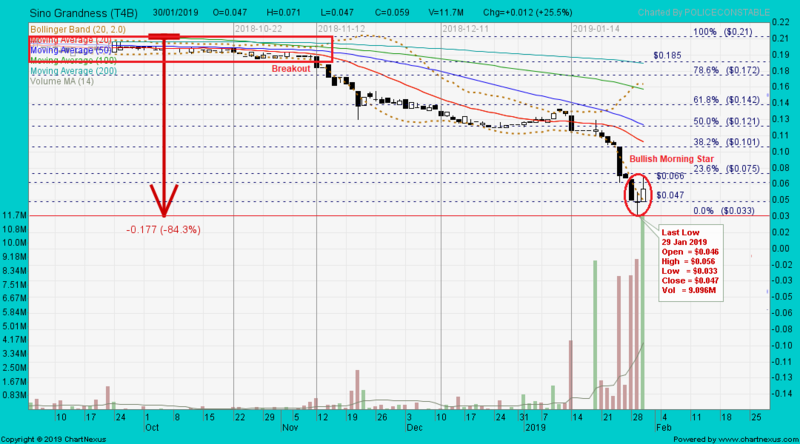 Immediate support @ S$0.062, immediate resistance @ S$0.078. Sino Grandness closed with an inverted hammer @ S$0.103 (-0.002, -1.9%) with 850,000 shares done on 23 Jan 2019. 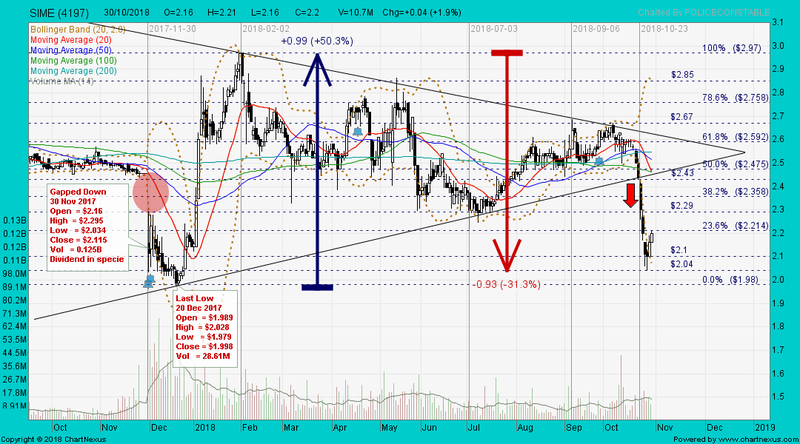 Immediate support @ S$0.095, immediate resistance @ S$0.11. 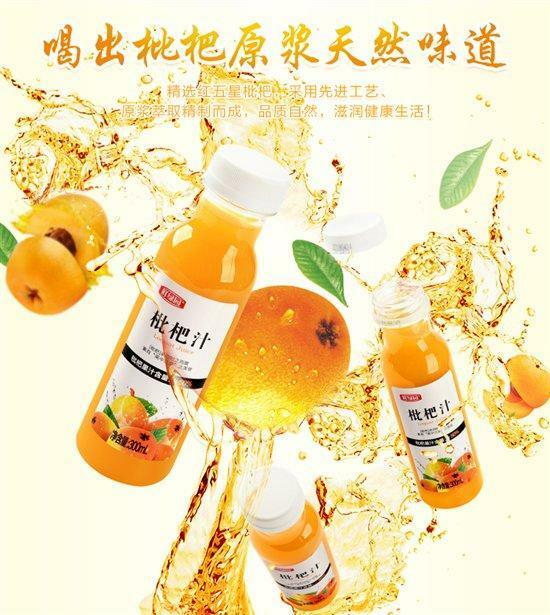 Sino Grandness said on Thursday that it has agreed to an amended bond repayment extension related to bonds issued by Garden Fresh (HK) Fruit & Vegetable Beverage, its indirect and wholly owned subsidiary. Under the new deal, Garden Fresh Cayco will issue creditor GS a first 2012 preference share and Garden Fresh HK will fully redeem its 2012 SB2 bonds and 2011 SB2 bonds by the new completion date, which is in around 12 months, it said in a filing to SGX after the market close on Thursday. 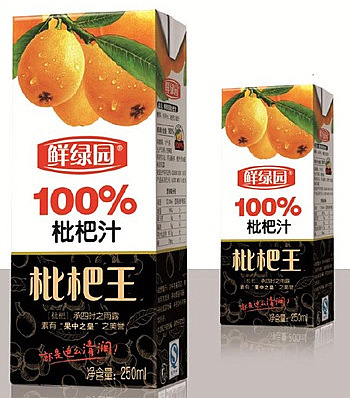 The outstanding 2011 and 2012 bonds will be substituted with the issuance of 2011 and 2012 preference shares, which will be convertible under certain conditions into ordinary shares of Garden Fresh Cayco, it said. The 2012 preference shares, which are majority held by GS, are convertible into 13.0 percent of the shares in Garden Fresh Cayco, while the 2011 preference shares, which are majority held by creditor CDIB Capital, are convertible into 3.876 percent of Garden Fresh Cayco shares, the filing said. 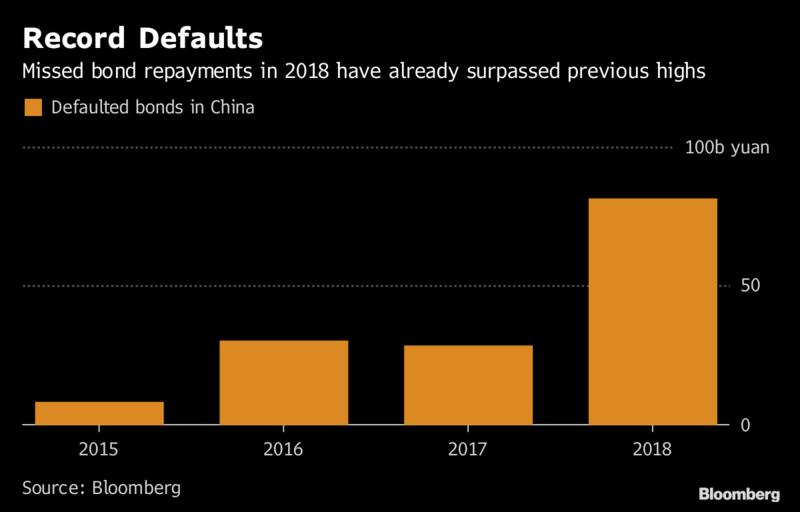 No new shares will be issued in connection with the bond repayment, Sino Grandness said. Sino Grandness requested a lifting of the trading halt on its shares that went into effect yesterday. The bond restructuring in 2016 whittled the principal amounts to RMB 210m, from the initial RMB 370m. But the outstanding bonds were still subjected to the high interest rates of 25% and 20%. 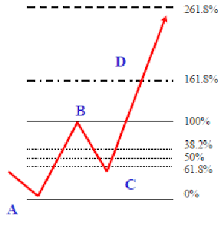 ♦ the interest rate in the event of redemption is either 9% or 7%. Sino Grandness closed with a black marubozu @ S$0.048 (-0.031, -31.4%) with 8.10m shares done on 28 Jan 2019. 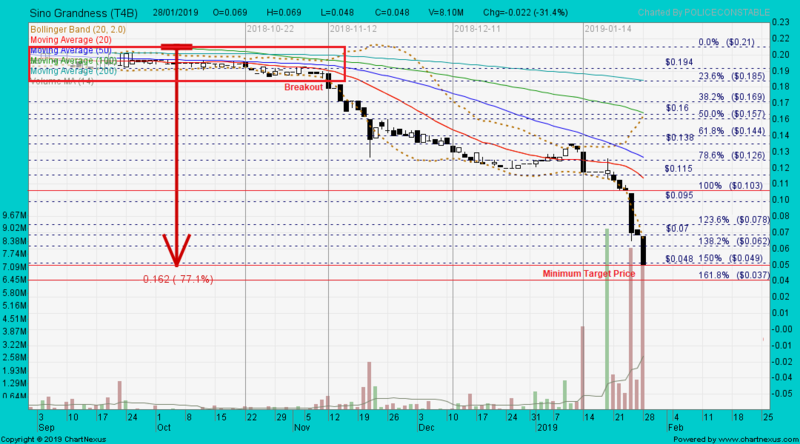 Immediate support @ S$0.037, immediate resistance @ S$0.062. Sino Grandness closed with a bullish morning star @ S$0.059 (+0.012, +25.5%) with 11.7mm shares done on 30 Jan 2019. 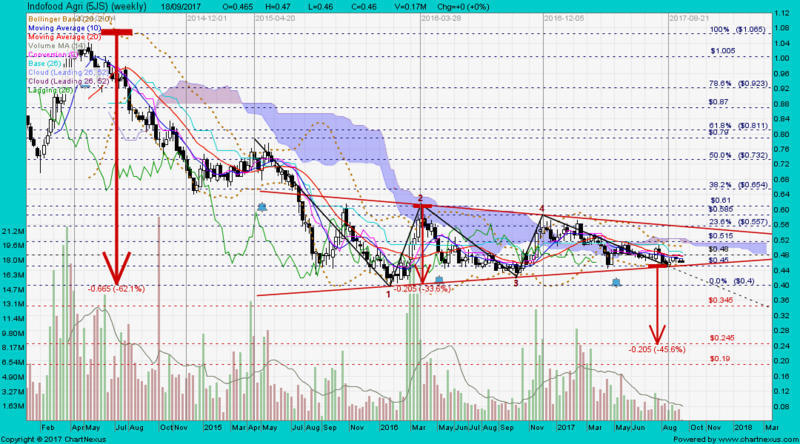 Immediate support @ S$0.033, immediate resistance @ S$0.075. Sembcorp closed with a hammer @ S$2.57 (-0.03, -1.2%) with 4.34m shares done on 30 Jan 2019. 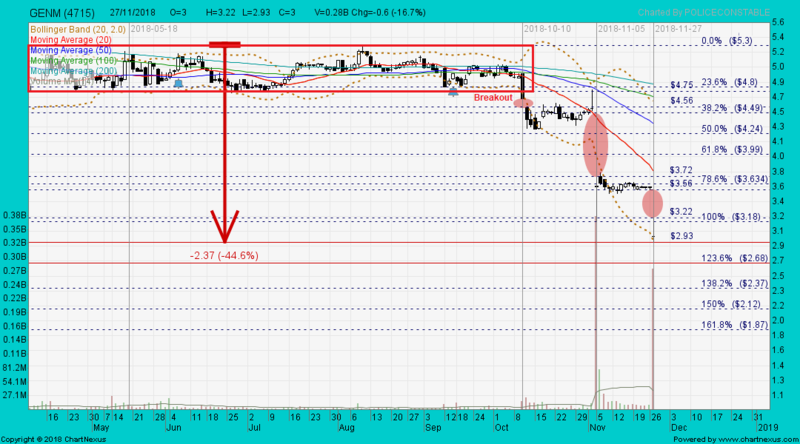 Immediate support @ S$2.56, immediate resistance @ S$2.63. 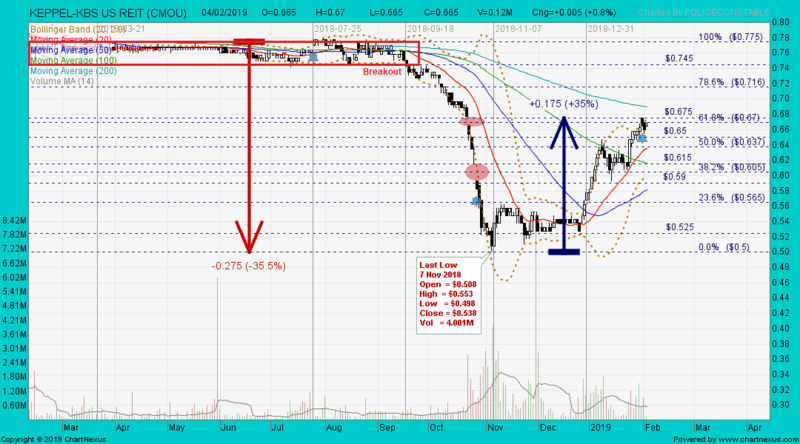 GENTING closed with a doji @ RM6.91 (+0.02, +0.3%) with 6.15m shares done on 30 Jan 2019. 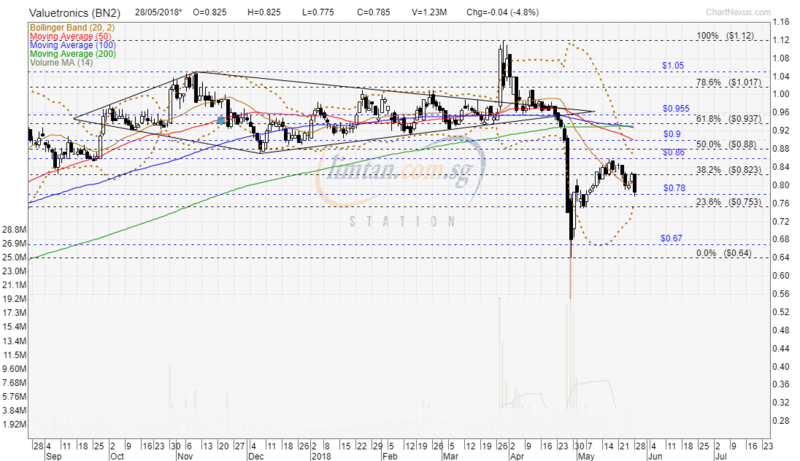 Immediate support @ RM6.81, immediate resistance @ RM7.04. GENM closed with a spinning top unchanged @ RM3.21 with 13.3m shares done on 30 Jan 2019. 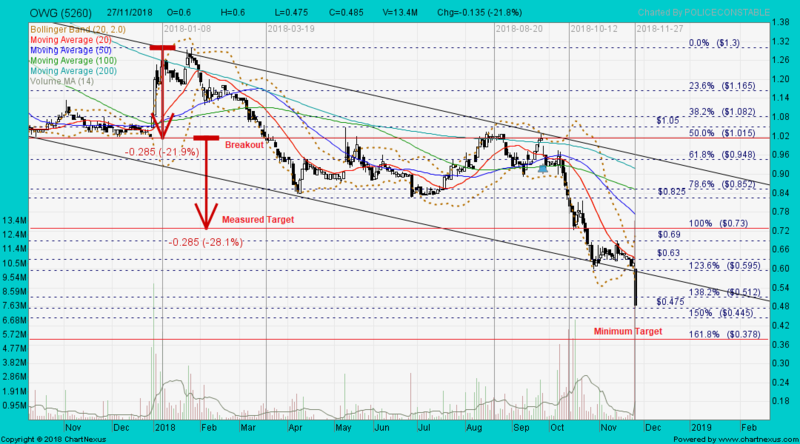 Immediate support @ RM3.10, immediate resistance @ RM3.35. 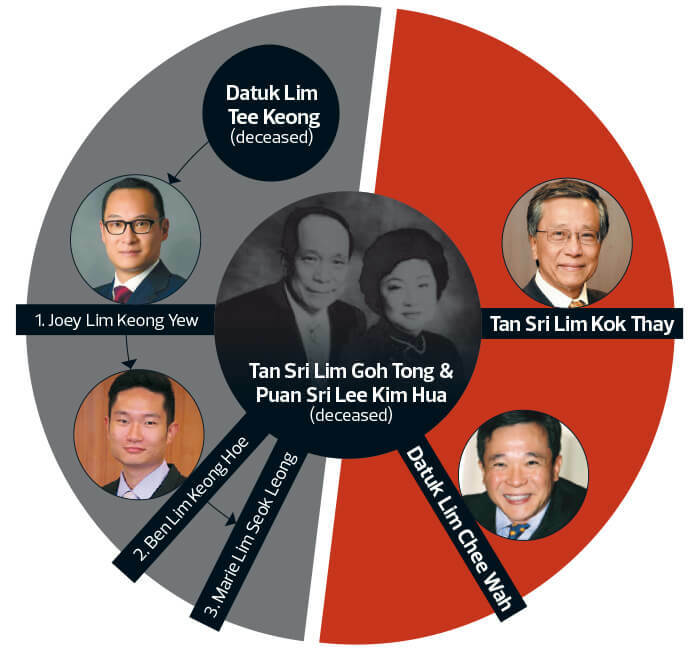 In a countersuit filed on Wednesday, Fox alleges that the project was doomed by Lim Kok Thay, the mercurial chairman of casino conglomerate Genting Malaysia Berhad. The suit, filed in U.S. District Court in Los Angeles, alleges that Lim routinely demanded changes to the park’s design, failed to properly manage the project, and ignored critical deadlines. A Romanian arrives in Singapore as a new immigrant. He stops the first person he sees and says, "Thank you Mr Singaporean, for letting me come to this country, get a job and free education for my children". The passerby replies, "You are mistaken. I am from India". The man then goes on and encounter another passerby. "Thank you for having a beautiful country here in Singapore". The person says, "I am not Singaporean. I am Bangladeshi". He walks further and he stops at the next person he encounters, shakes his hand, and says, "Thank you for having a wonderful country - Singapore". The person says, "I am from China. I am not Singaporean". He finally sees a nice lady and asks, "Are you Singaporean?" She says, "No, I am from Philippines". Puzzled, he asks her, "Where are the Singaporeans?" She replies, "Oh, they are fitness freaks. They go around collecting cardboards!" 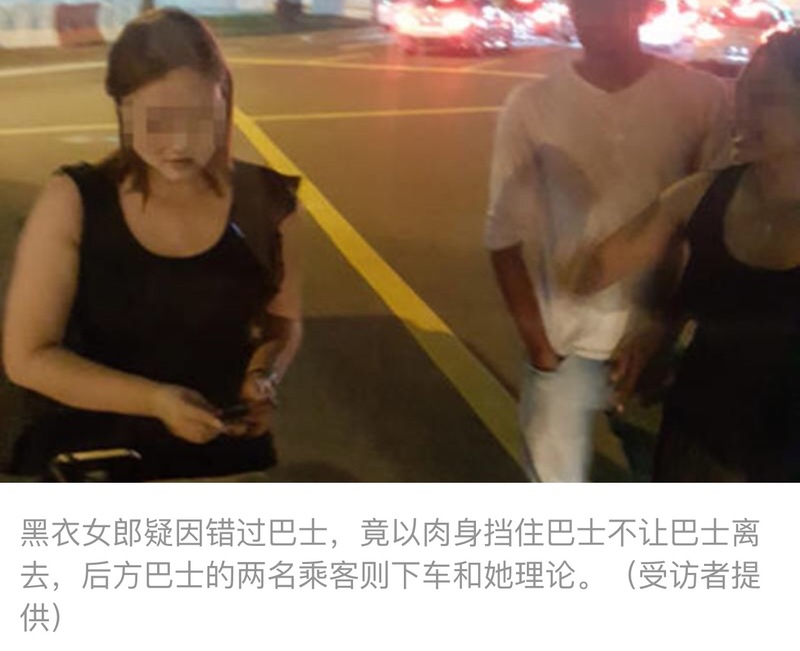 A PRC woman missed her stop and demanded the bus driver to U-turn back by getting down and blocking the bus...she failed to realize that she was holding up the bus driver and all the passengers inside the bus. Keppel KBS US Reit closed with a gravestone doji @ US$0.665 (+0.005, +0.8%) with 120,000m shares done on 4 Feb 2019. 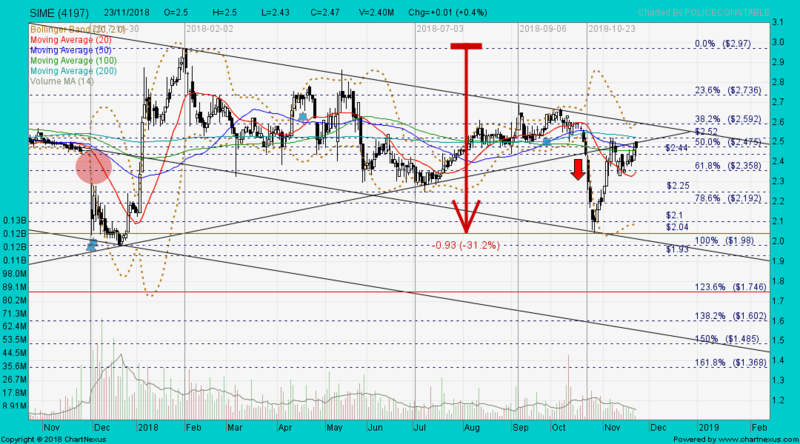 Immediate support @ US$0.65, immediate resistance @ US$0.675. Typo error corrected in red. Keppel KBS US Reit closed with a gravestone doji @ US$0.665 (+0.005, +0.8%) with 120,000 shares done on 4 Feb 2019. Valuetronics closed with a black marubozu unchanged @ S$0.70 with 370,000 shares done on 4 Feb 2019. 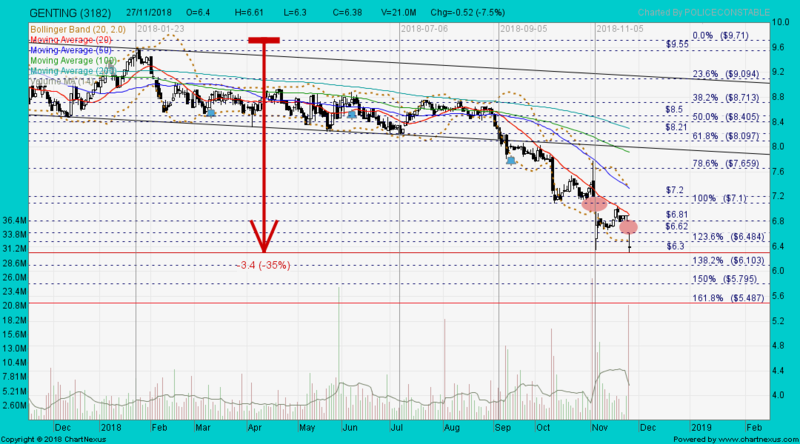 Immediate support @ S$0.68, immediate resistance @ S$0.72. Valuetronics had a black marubozu and traded @ S$0.785 (-0.04, -4.8%) with 1.23m shares done on 28 May 2018 at 0950 hrs. 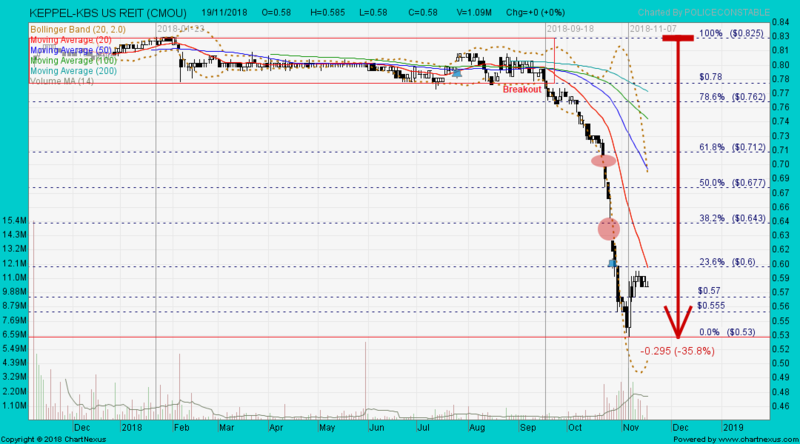 Immediate support @ S$0.75, immediate resistance @ S$0.86. For the first nine months of 2018, QAF reported that revenue fell by 3% year on year, while operating profit plunged 90%. The weak performance was mainly driven by lower revenue as well as an increase in operating cost (mainly due to a higher cost of material in its bakery and primary production business). In addition, one-off costs such as foreign currency losses, fair-value loss of biological assets, and costs related to an ammonia leak affected the company’s performance negatively in 2018. Furthermore, the company expects raw material prices to remain a pressure thanks to high flour and fuel prices, implementation of the Sales and Services Tax in Malaysia, and higher imported material costs in the Philippines as a result of the weakening peso. Moreover, the primary production business will continue to face pressure from an oversupply situation as well as higher grain and fuel prices. 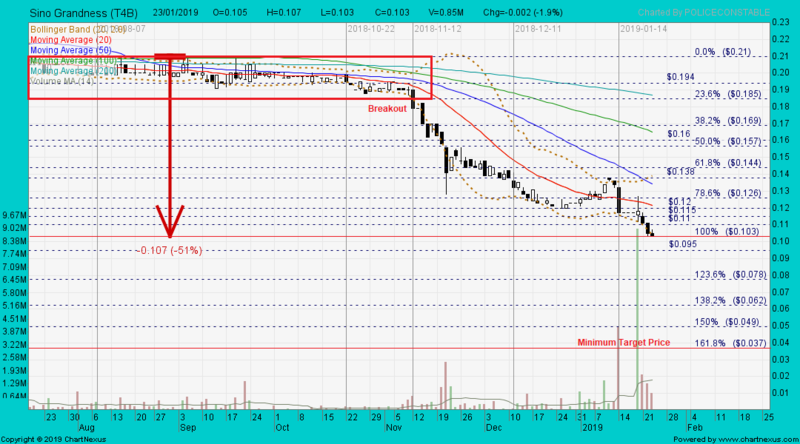 QAF closed with a dragonfly doji unchanged @ S$0.705 with 97,100 shares done on 11 Feb 2019. 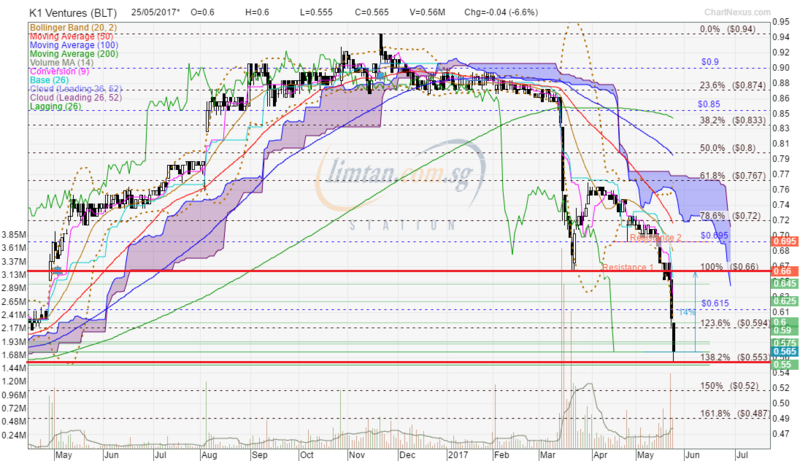 Immediate support @ S$0.675, immediate resistance @ S$0.715. QAF closed with a doji unchanged @ S$0.735 with thin volume done at 36,300 shares on 26 Oct 2018. 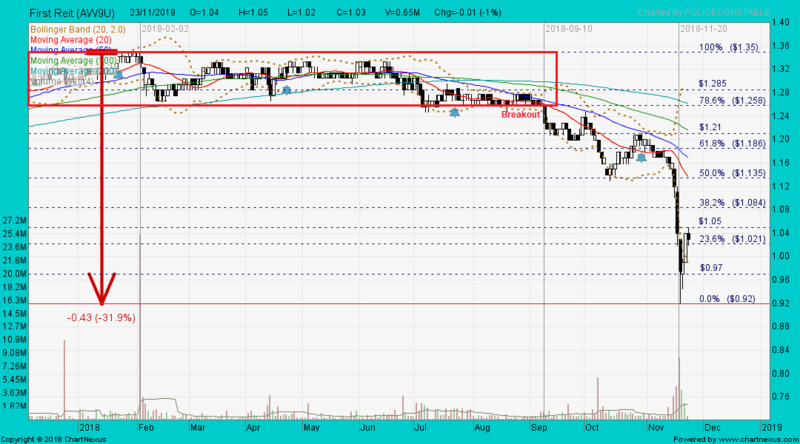 Immediate support @ S$0.72, immediate resistance @ S$0.75. SIA Engg gapped down and closed with a black marubozu @ S$2.39 (-0.13, -5.2%) with 1.36m shares done on 11 Feb 2019. 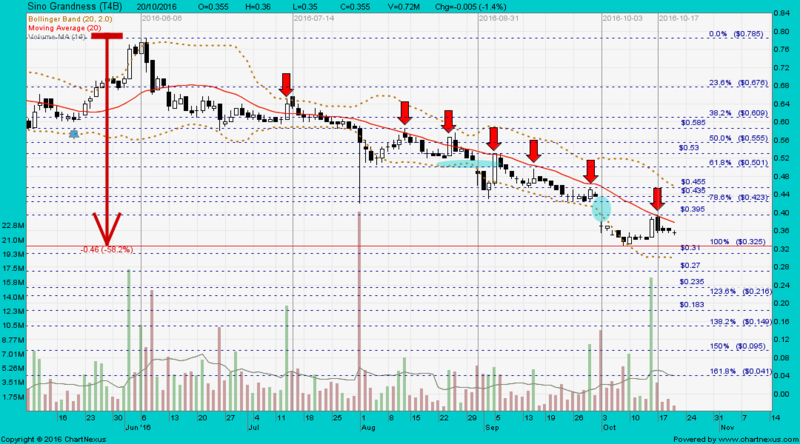 Immediate support @ S$2.30, immediate resistance @ S$2.44.